There are over 60 manufacturers of dental implants and materials used to create restorations such as abutments and crowns. For this reason, dentists have a variety of options to find the implant treatment that is best for the specific needs of their patient. That said, if you go to a particular dentist to have the post implanted, but see a different one for abutment/crown placement or repairs, the latter may not have enough experience, be familiar with or have access to the same components that the first dentist used. This can further complicate an already complex process and make the procedure even more expensive. Dental implants are categorized either by their shape and placement or by the procedure used to place them (single or two-stage). 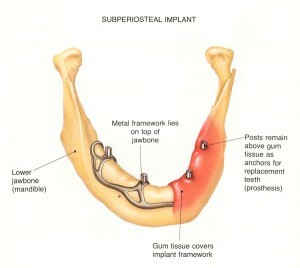 Subperiosteal implants are commonly used for single stage procedures. They are positioned inside the gum tissue on the jaw bone. The post protrudes from the gums to hold the restoration. The primary advantage of this type of implant is that it can hold dentures securely for individuals who do not have enough bone height. These dental implants are the most commonly used for two-stage procedures. They are surgically implanted directly into the jaw bone and are an alternative to bridges or detachable dentures. As seen below, they come several types including screw/threaded, cylinder/smooth and bladed. The two stage procedure is the most commonly practiced method. The implant is surgically placed in the jaw bone so that it lies flush with bone underneath the gum. The gum tissue is then closed with stitches to protect the implant from force while the surrounding bone heals and fuses to it. After a period of healing, a second (minor) surgery is conducted to uncover the implant in order to attach the abutment and temporary restoration. This method involves a longer one-piece implant that protrudes through the gum once it is placed in the jaw bone. After the healing period the abutment and crown can be placed without additional surgery to uncover the implant. 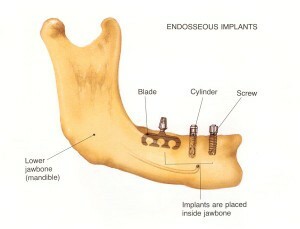 Alternatively, a two piece implant like the one in the two stage procedure can be used. The implant and healing abutment are immediately connected during the initial surgery. The downside of this method is that the implant is vulnerable to external forces and extra caution must be taken to make sure that the healing process is not interfered with. Research has shown that both one and two stage procedures have similar rates of success. Ask your dentist or oral surgeon which approach they use and discuss which type would benefit or be appropriate for your particular situation. 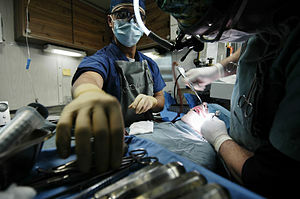 In carefully selected cases, the implant and restoration are both placed during a single surgery. The implant is surgically placed immediately following extraction of the tooth and placement of the crown follows shortly after. Sufficient bone volume and density are required in order to be a candidate for this procedure. The vast majority of dental implants are made of titanium, but the surface material of the implant varies. The material used is a major factor in the treatment’s stability and long-term strength. A porous surface enables more bone contact compared to a smooth titanium surface. 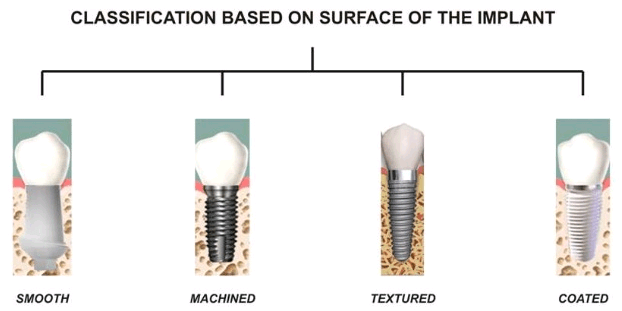 The other types of implant surface treatments are acid-etched or grit-blasted and roughened surface, plasma-sprayed hydroxyapatite coating, and a plasma-sprayed or microgroove titanium surface. Internal hex connectors – These connectors have a hexagonal shape and are an opening in a dental implant’s head that the dentist screws the abutment or restoration into. External hex connectors – These hexagonal shaped connectors are located on top of the dental implant’s head. Internal octagon connectors – These octagonal shaped connectors are has an opening in the dental implant head that the dentist screws the abutment or restoration into. Implants may be identified according to their size (platform). This can determine where they can be positioned inside the mouth. Each case is different though, so the size used depends on a person’s spacing and bone availability. Standard platform implants – have a diameter ranging from 3.5 mm to 4.2 mm. They are usually placed in the front part of the mouth. Wide platform implants – these implants, which have a diameter ranging from 4.5 mm to 6 mm, are typically placed in the back of the mouth to replace molars. Mini or narrow implants – have a diameter that ranges from 2 mm to 3.5 mm. They are placed in individuals who do not have enough space between the roots of their teeth for a regular sized implant. They are also used when the patient does not have sufficient bone density. Oral surgeons and periodontists are trained to perform the surgical procedure. There are also many general dentists who have gone through the necessary education and training required to perform the procedure. Crown, implant, and oral surgery training provided by private organizations can be completed in a relatively short time. Widely recognized organizations such as the American Association of Oral and Maxillofacial Surgeons and the American Academy of Periodontology provide more extensive training. These are the things that you need to consider when you plan to undergo an implant procedure. It is very important to choose a dentist who knows what they’re doing, so don’t be afraid to ask them about their previous experience and where they were trained. It is also important to note that dentists are not required to have a special license to perform a dental implant procedure. General dentists can perform the restoration of a crown and bridge, which is part of the implant treatment, and they can place the implant themselves. What type of implants are you considering (or already have)? Let us know in the comments! I have a question, I am wanting implants but the cost is astronomical and just not within reach. I am trying to find ways to cut all those roads down to a simple affordable road. It is not easy. the question i have is a dentist here in Mesquite Texas will place 4 implants on my top mouth for a total of 5,030.00 but those will be just the titanium screws not the upper dentures. I noticed these were going to be snap on however i was wondering.. Are the titanium screws that go inserted in the mouth. Are they all the same as titanium for snap ons and screw ins? just the screws.. not the abutment or crown.. just the screw.. Are they made differently if they are intended for snap on versus permanent?